Songs of times ahead and times gone by....It's good to do some rememberin' and some lookin' down the road. Jim Hawkins is a Colorado-based singer, songwriter. He draws from his experiences growing up in Wyoming, Texas, New Mexico, Arizona and Colorado to tell stories of the new and old West. 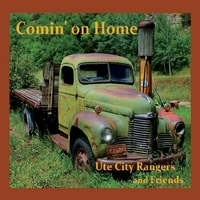 Jim and good friend Fred Hamilton have combined to make two CDs of original songs as the Ute City Rangers. Fred grew up on the Atlantic coast of central Florida, surfing and playing guitar. His up tempo playing, whimsical melodies and lyrics adds a positive energy to the "Rangers" folk/Americana songs. Jim is a retired Denver Fire Department firefighter and medic as well an old desert rat, who spent much of his youth in the Sonoran deserts of Arizona. His songs often reflect his thoughts about those days. As a lover of history, he often interjects obscure details into his songs that may or may not be known by the listener but add a certain sense of intrigue to the story. With the release of their third Album "Comin' on Home", the Ute City Rangers have embarked on an even more collaborative journey. Several of the tracks feature Fred Hamilton's tunes combined with Jim Hawkins' lyrics. They often refer to these pieces as "HamHawk" songs!